A baby product manufacturer recalled on Friday about 447,000 of its infant car seat carriers, including some branded with Eddie Bauer and Disney logos, after getting dozens of reports of the carrier's handle coming loose. There have been at least three injuries to babies, including bumps, bruises and a head injury. Dorel Juvenile Group Inc., of Columbus, Ind., received 77 reports of the child restraint handle fully or partially coming off the products. In announcing the recall, the government said consumers should immediately stop using the seat's carrying handle. The bolts that attach the handle to the seat can loosen, causing the handle to possibly separate and creating a fall hazard for babies. The recall involves Safety 1st, Cosco, Eddie Bauer and Disney branded infant car seat carriers with certain model numbers. They were sold at department and children's product stores nationwide from January 2008 through this month. 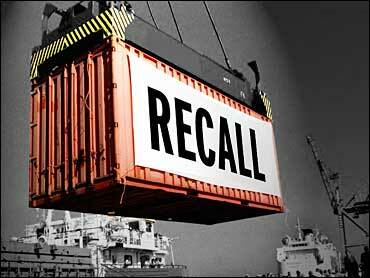 The recall was announced on Friday by the Consumer Product Safety Commission, National Highway Traffic Safety Administration and Dorel Juvenile Group. The traffic safety agency said consumers should not use the handle until a repair kit has been installed. The repair kit includes new bolts that consumers can attach to the handle and seat carrier. They can order these free repair kits by contacting Dorel at 866-762-3316. "You don't want to take a chance by using this recalled car seat carrier, until you have the repair kit in place," said Patty Davis, a spokeswoman for the Consumer Product Safety Commission. "The handle can fall off and the car seat carrier can drop, injuring your infant." The traffic agency said the car seat is safe for use in a vehicle because it meets federal safety standards. The recalled products were sold with strollers, but these are not affected by the recall. A spokeswoman for Dorel said she could not immediately comment.